The countdown continues! In 30 days, the 2018 staff will come together on the shores of Big Blue Lake for the very first time. Until then… Meet Chandler, Abby, Rod, Gabi and Aiden! Hey everyone! My name is Chandler, and this summer will be my sixth year coming to camp. It’s been such an amazing experience and has helped me to figure out where I am headed in my life. I am going on to continue my education at Central Michigan to major in secondary education mathematics. I’ve also been able to help my dad as a manager for the Whitehall girls Varsity soccer team and continue with one of my other many passions in my life: soccer! It’ll be so nice returning to camp for another summer, and I look forward to see both new and returning campers for another amazing year! Hello everyone! 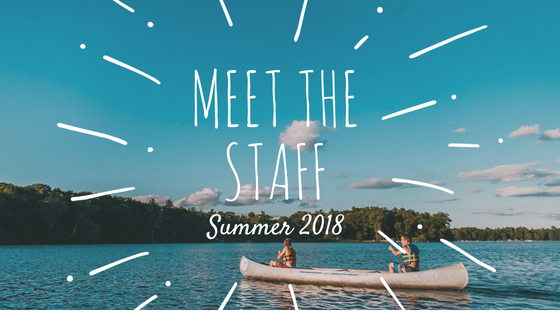 I’m Abby, a third year staff member at Pendalouan returning for my tenth summer overall on the shores of Big Blue as Assistant Teen Director working with the CIT’s! I am from Muskegon, Michigan, but currently live in Ann Arbor because next year I will be a junior at the University of Michigan studying Art & Design. I love singing, playing the flute, swimming, and watching Moana. I’m SO excited to get back to camp and do archery, visit the horses, sing camp songs, and most of all- see old friends and meet new ones! Catch you later! Hello all! My name is Rod and this is my first year as a camp counselor. For most of the year I go to school at The Art Institute of Michigan to become a chef. You can usually find me reading or watching football (Go Saints!). I’m so excited to be apart of your summer. I can’t wait for camp to begin so I can help sing those crazy songs, play (and win) CTF, and spend time around the fire with all of your smiling faces. Summer of 2018 is going to be epic. See you soon! Hello Pendy People, my name is Gabi!! I grew up in Michigan but i currently live in Indiana. I will be moving out to Arizona for college this Fall to study Elementary Education! This will be my 10th summer at Pendalouan, and 2nd summer on staff. When I’m not at camp you can find me hanging out with friends or swimming. I am VERY excited to spend this summer swimming in Big Blue, singing and dancing all the time, and making some unforgettable memories! See you all soon!!! Hello! My name is Aiden, and I’m from Chicago! I go to Palatine High School, which is in a Northwest Suburb of Chicago. I love music, both listening to and playing, and I also love running! On any given day you can usually find me doing one of those two things. I am so excited for this summer and especially excited to meet all the campers and do some swimming in Big Blue Lake! I can’t wait to see everyone very soon!! Remember to check out our next live Facebook Q&A on Monday, May 15th at 7 p.m. EDT. Matthew will be discussing Homesickness and answering any questions you may have.